I took a break this afternoon to wander outside and enjoy the snow of yesterday. It had stopped snowing last night, and the day dawned clear, with a gorgeous blue sky and brilliant sunshine. These are the sorts of days that I love about winter. That, sitting by the fire, and fat softly-falling snowflakes. I could do without the slushy, slippery roads, the freezing rain, the bitterly cold winds (although these are all easier to take while sitting by the fire). 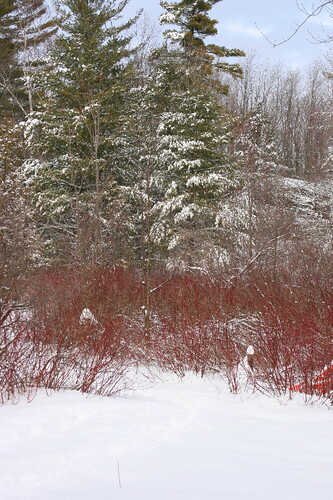 The bright white snow and blue sky wonderfully set off the green conifers and red dogwood. 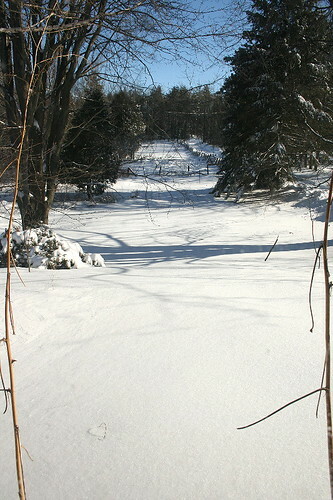 The snow in the front yard was clean and pristine, stretching out beneath the big trees. I can’t bring myself to walk through it, it doesn’t seem right to spoil something so clean and fresh and full of promise. I’ll leave that to the squirrels and rabbits, and I skirt around. 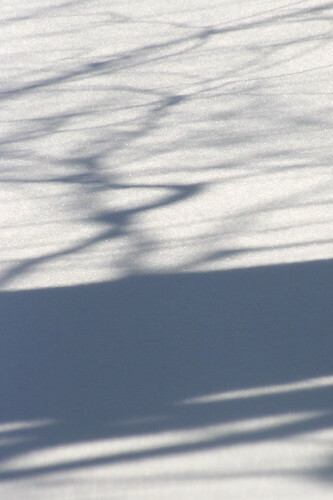 The smooth white of the unbroken snow makes a great canvas, catching the shadows of the big maple above. It seems somewhat abstract, like something that should be hanging in a museum somewhere. Nature is a great artist. One downside to all this snow is the necessity of clearing it from the driveway so people can come and go. 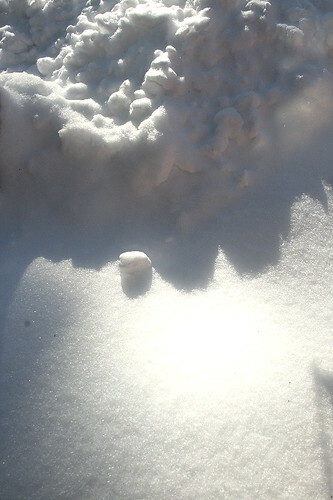 Here a snowball has rolled down off the giant snowbanks created by the plow (they were at least up to my waist in front of the house, and can be larger along the drive). My parents have an old 1945 Ford tractor that my dad has managed to keep running all these years and has hooked a plow to, used primarily in the winter for clearing snow. It’s been a faithful machine, and, given the length of the driveway (see the second photo), let’s hope it continues to be! 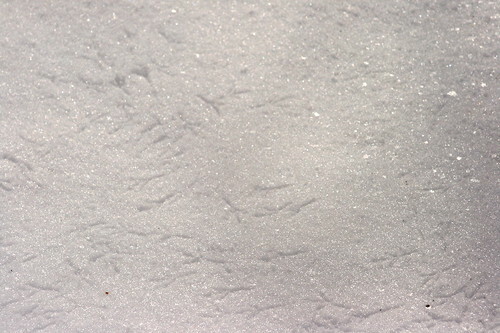 All this deep snow can be a challenge to ground-foragers such as the juncos and tree sparrows. At these times feeders become an invaluable resource that allows more birds to survive the harsh weather than might be able to without a supplemental food source. My mom tries her best to keep the feeders stocked through the winter, though wading through knee-deep snow can be a challenge. Certainly appreciated by the birds! I wasn’t the only one out enjoying the fresh snow. 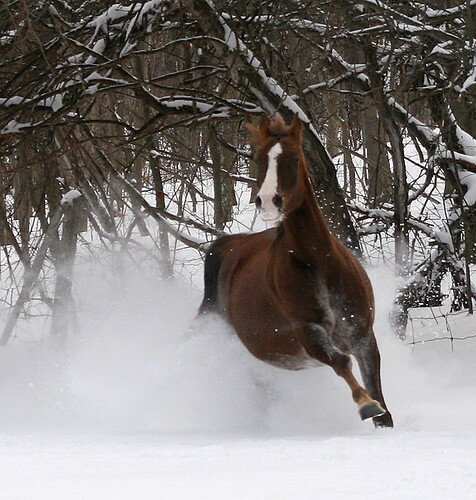 The two younger horses were having a grand old time frolicking in the white stuff, throwing up plumes of it as they raced through. After a few laps around the field they pulled up near the gate where I stood, their bellies caked with snow, their nostrils wide as they panted deeply. But their eyes sparkled with energy and enjoyment.